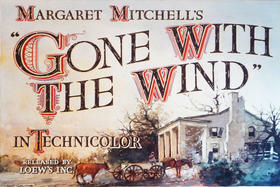 Wilbur Kurtz created this title card for "Gone with the Wind" in 1939. It is currently on display at the Atlanta History Center. Today marks the 75th anniversary of the Atlanta premiere of the film “Gone with the Wind.” The movie, directed by David Selznick , was based on Margaret Mitchell’s book of the same name about Atlanta during the Civil War. It was an immediate hit upon its release, and someone instrumental in its success was Wilbur G. Kurtz. Kurtz was an artist and historian who worked to ensure the historical accuracy of the film. The Atlanta History Center is currently running an exhibition on Kurtz, and it contains over 40 images and artifacts that give insight into his knowledge of Atlanta history. WABE visited the exhibition to speak to curator Don Rooney, and he told us how Wilbur G. Kurtz originally became involved with David Selznick’s production of “Gone with the Wind.”Broadcast version of the story that originally aired on Dec. 15, 2014. More information on this event may be found here. The Atlanta History Center also has footage from the film’s premiere, which may be seen here.